Shane Faber has been a web developer, systems engineer and networking professional since 1996. He took his original Altiris training at the corporate headquarters in Lindon, Utah and has earned the Altiris ACE and AAC certifications. 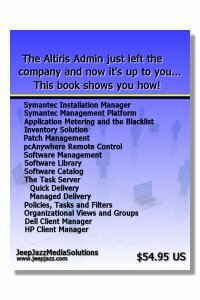 Working as a consultant and at times, directly with Altiris and Symantec Professional Services, he has provided support to government, corporate and education customers ranging in size from 100's to 1000's of seats. Supporting Altiris projects has taken him all over the United States, Japan and in 2004, to Baghdad, Iraq. Everybody has different priorities and challenges that are unique to their network. Let's face it, that's why you're looking at a product like Client Management Suite in the first place. Benefit from his experience with CMS6 and CMS7. 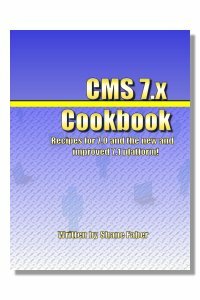 Get the new "CMS 7.x Cookbook " for all the latest tips on the newest versions. The CMS7.1 Cookbook is here! 1. Have heard about Altiris and wonder if it can help you get home any earlier. 2. Have bought Altiris CMS and tried to set it up yourself (bravo, but risky!). 3. Have just replaced the only guy at the company who knew how to use it. Hang in there! This book will get you where you need to go. the international edition does cost more. After you click this 'BUY NOW' button, you will be transferred to the PayPal site. At the bottom left on this page, select the 'Continue' link if you do not have a PayPal account. Follow the prompts and provide a shipping address. EMAIL jeepjazz@hotmail.com for a custom quote.